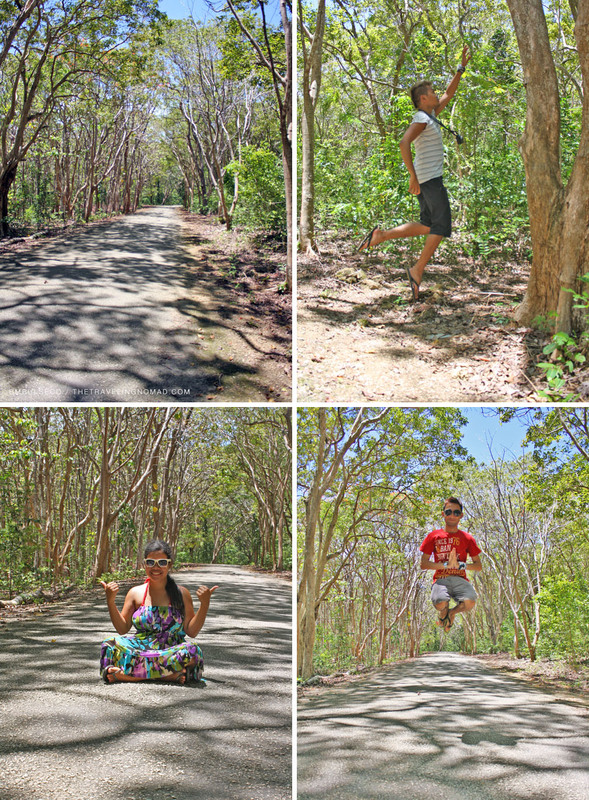 It was a hot and humid Thursday afternoon when we toured the island of Siquijor. Due to lack of sleep, I just dozed off inside the tricycle as we made our way to our next destination - Salagdoong Beach. The sun was at its zenith when we arrived at Salagdoong Beach. I thought I was still dreaming. Salagdoong Beach is located in the town of Maria, situated on the eastern part of the island. The beach is owned and managed by Siquijor's Provincial Tourism Office. Despite being a public beach, it is still clean and well-maintained. Kudos to the local government of Siquijor! There were lots of people in the resort when we arrived, but not enough to make the resort crowded. The leaves of the Talisay trees were red during that time and it added more drama to my photos. The photos were so beautiful that I didn't need to post process all of it. Saves time and energy. Robbie and Ate Gael decided to take a dip while I decided to roam around the resort. I have read a few blog entries about this beach dating back to 2010 and from their entries, there were no slides and other infrastructures within the property. But, when we went there last month, we saw heavy equipment on the left side of the resort. They were probably building a 'bay walk' where people can chill out and relax with their family and friends. On the right of the resort, two slides are attached on top of a natural limestone cliff. Two concrete planks were built on top of the cliff's highest point to provide an 'adrenaline' activity in the resort - cliff diving. We witnessed a couple of brave souls who took a plunge to the deep aquamarine waters of Salagdoong Beach. Good thing was, they emerged unscathed and even jumped again from the cliff! I surmised that it's an addicting activity. But the three of us decided to take pictures on the concrete plank. We spent more than an hour at Salagdoong Beach. Sun rays torridly kissed our skin as we explored the public beach. Although in my opinion, the beach would look more quaint if it remained as it is. But still, the beauty of Salagdoong Beach is still there - well maintained and the locals are disciplined as well. We left the beach at around one in the afternoon. Good thing I didn't sleep inside the trike because this was the view that I completely missed out when we entered the beach. Salagdoong Beach is a must-visit place in Siquijor! 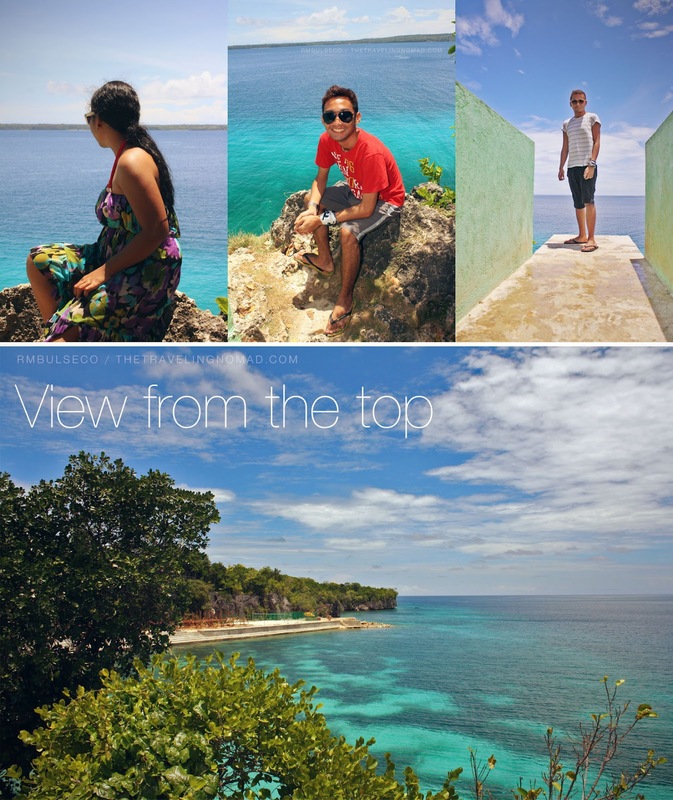 The next time I visit Siquijor, I'll definitely jump at the 25-foot cliff of the beach. But of course! Hahaha! Kelangan ko nang tapusin ang Siquijor! Malapit na ang DFAT! parang bigla nagising ang diwa mo. haha! Magkikita na naman tayong tatlo this week!!!!!!!! Ang shobaer kez = ang taba ko. Lol. wow ang ganda!! Never been to this part of the Philippines, hope to visit this place too. Is that a cashew tree (the one with red leaves). Parang autumn sa tropics, hehe. Talisay tree. Oonga parang fall lang naman. Honggondo-gondo!!! Love the red leaves (and your red shirt, hehe) on the aquamarine sea. The contrast is striking. Siquijor is unexplored place yet for me. I've not yet known that there's a paradise in that place. Every place being posted is of great view. And this is one deserves to be promoted and visited. OMG!!!! ang super ganda ng place!!! parang post cards mga photos mo!!! gusto ko din maexperience yan!!!! Haven't been to Siquijor and never really found the time and people to go there with. Always wanted to go to siquijor... nice beach!!! unti unti nabuksan na ang pinto ng siquijor to the world net. dati, iba ang nasa isip ng mga tao....good post renz. wag na munang matulog. heheheh. Sobra linaw ng tubig dito ang sarap mamangka. Hindi ko masyadong na-appreciate yung Salagdoong Beach kasi late na kami dumating at nagmamadali. Accdg to Dylan, they used to swim there tsaka mas maganda nung hindi pa siya developed. Pagbalik ko ng Siquijor will vsiit this again and hopefully, may time to appreciate hahaha :D see you Renzzzyyy! there's a slide? when i went there way back in 2004, the entire salagdoong beach was bare, though a lot of people frequent the area. there were a few small cottages. i'm just glad hindi masyadong na-commercialize yung beach based on your photos. the water looks so clean. when you want to spend time with yourself alone. Salagdoong is still a must see spot in Siquijor despite all the unnecessary developments in the area. The slides should go. It's an eyesore. The cliff diving platform should stay because it makes it easier for us to do cliff diving. ganda po ng Siquijor :D how many hours po sya from davao? Hi Christine! It's quite far from Davao coz you have to fly to Cebu, cross the sea from Lilo-an to Sibulan, and ride a roro again from Dumags Port to Siquijor. Going ko to siquijor next week, Renz. I hope we can visit this place. ^^ I look forward to see their beaches. a very beautiful beach! awesome colors, just like autumn leaves. so lucky to live just an hour away from this beautiful island. Hi RM Bulseco, I have visited Salagdoong Beach last year at summer time at that time humidity was very high at that time but we enjoyed a lot in that place. I search some beaches in siquijor and bohol for skinny dipping !